"As I drove away, I felt deeply comforted knowing that magical things were still living in the world." 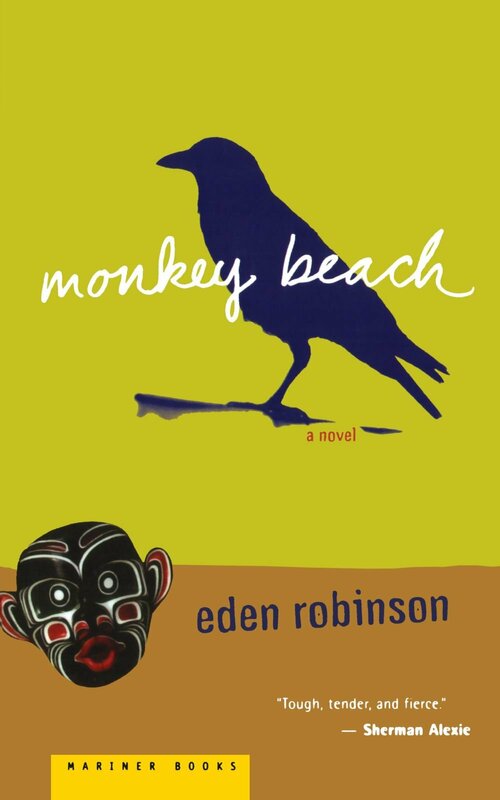 Eden Robinson's Monkey Beach has been on my radar for quite a while, I think since Eva reviewed it in 2012. I finally read it, and it's wonderful. I hope you all put it on your radar but don't take more than two years to read it like I did. Monkey Beach is set on the coast of British Columbia, in what I imagine is a majestic setting of mountains and forests and small islands. Lisamarie Hill wakes up one morning to the news that her younger brother Jimmy is missing. He was on a boat that sank and there is no word of him. Her parents leave to find him, and Lisa decides to go look for her brother, too, separately. She takes off in a small boat to Monkey Beach, where she and Jimmy grew up looking for the b'gwus (yeti) years ago. On her way there, readers are treated to flashbacks of her life. Lisa grew up under the loving care of not only her parents, but her uncle Mick, an Indian civil rights activist, and her grandmother, Ma-ma-oo, who cherishes the old ways but does not know as many of them as she wishes. She is also visited by spirits who bring her news of what is yet to come. Oftentimes, we are told that children who grow up in happy homes become happy, well-adjusted adults. Father figures are integral to this, as well as strong mothers. Lisa grew up with very loving parents and a brother who adored her. She was close to her uncle and to her grandmother. But, as Robinson points out with great subtlety, this is not always enough. Lisa's town doesn't have much going for it - fishing is an industry, but it seems to be drying up. There's also a cannery, but work conditions there are tough. No one that Lisa knows has plans to go to college, so she sees no point in going, either. She is surrounded by alcoholism, abuse, and people who have reached dead ends. Her brother is a superstar swimmer, and everyone latches onto that as one of the few ways for Jimmy to get up and out into the larger world. Where, hopefully, he'll be treated fairly. But if patterns continue, everyone from Lisa's town will face racism and discrimination for the rest of their lives. Lisa is very different from her brother. She believes in magical beings. She knows how to build a fire, live off the land, and tell stories. These traits are not highly valued in modern life, though, and she struggles in school. She makes friends but keeps them at arms' length. She cares deeply and completely for those she loves but does not show it. As she gets older, she isolates herself more and more from the people she needs most. Lisa's story is a difficult one. She goes through a lot of tough times, but she's a resilient and strong character. I fell completely in love with her, though it was tough to stay with her through her internal struggles. It may be very optimistic of me, but I think if there were an epilogue to this story, it would involve her struggling (but succeeding) to get through school, tentatively starting to date a guy she should have dated long ago, and finding a way to keep the spirits at bay. Truly, this book was beautifully written. I think some people will probably struggle with Robinson's style of writing. She goes back and forth a lot, includes some non sequitors about b'gwus and the heart, and shows us a lot more than she tells us (particularly in the last several pages). But I loved being a part of the deep and strong bonds that Lisa formed with her uncle and her grandmother, the fierce determination she had to help her brother, and her struggles to take control of her life. Highly recommended. Thanks for your review. I just signed up to get this book. You have me very eager to read it. I finally got around to reading your review! I try not to read reviews of books I'm reading/going to write about. But yes! That bit where you said about struggling with her style of writing - definitely here and there for me, it wandered a bit and made my mind wander away from it. But its wonderfully built characters and relationships brought me back to it again and again. Great review! I hope more people read this book!